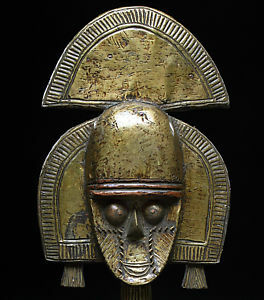 Types of Art: The most recognized of the Nuna art forms are magnificent wooden masks colored red, white, and black. In addition anthropomorphic figures sculpted from clay and wood and various personal objects, ranging from jewelry to wooden stools, are created to honor the spirits. History: Nuna emigrated from nothern Ghana in a northward direction together with their Winiama neighbors at the end of the 15th century before the Nakoms� advance. The Mossi invaders were never able successfully to maintain power in Nuna territory because the horses on which they depended for military power quickly became sick and died. The bush surrounding Nuna territory is infested with the tsetse fly, making sleeping sickness endemic. Mossi accounts tell of the magical powers of Nuna peoples and their neighbors. Because of the structure of Nuna towns, they were difficult for cavalry raiders to penetrate. Nuna farmers could stand on the roofs of their homes and kill any mounted warriors who dared to enter the narrow alleys between houses. The region, however, was constantly ravaged by slave raids perpetrated by the Mossi, Fulani, and Songhay, until the end of the 19th century. Economy: Nuna are primarily sedentary farmers, growing millet, sorghum, and yams. Maize, rice, peanuts, and beans are grown in addition to these staples. Farmers throughout the region practice slash and burn farming, using fields (keri) for approximately seven or eight years before they are allowed to lie fallow for at least a decade. In the family fields close to the villages, women grow cash crops, including sesame and tobacco, which are sold in local markets. Men participate in hunting during the long dry season. This is important for ritual reasons, since it is during this time that men may interact with the spirits that inhabit the bush. During the dry season, when food supplies are running low, some fishing is practiced in local swamps. Political Systems: Nuna societies are comprised mainly of farmers, without social or political stratification. They are not divided among occupational castes or groups since most of them simply till the land and engage in occasional hunting. Before the arrival of the French, they had no internal system of chiefs, and all important decisions were made by a council of elders consisting of the oldest members of each of the village lineages. Religious leaders do maintain some political authority, determining the agricultural cycle and parceling out land for cultivation. The French established local puppet rulers, and the families of some of these maintained nominal political power until the revolution in 1983. Religion: Belief in a supreme creator being is central to Nuna beliefs. A shrine to this god occupies the center of every village. An element of this creator god is Su, the mask spirit which is enshrined in the oldest and most sacred mask in the community. The spirit of Su can be harnessed to benefit the community or to cause harm to their enemies. When Su is properly appeased, communal harmony is achieved. He is responsible for providing women with fertility and is recognized for his role in the continuity of life. Each extended family maintains its own hut, in which the lineage magical objects are kept. The objects allow the family to maintain contact with the vital forces of nature. These objects are inherited by the ancestors and are the communal property of the lineage, providing protection and social cohesion among all members of the family.